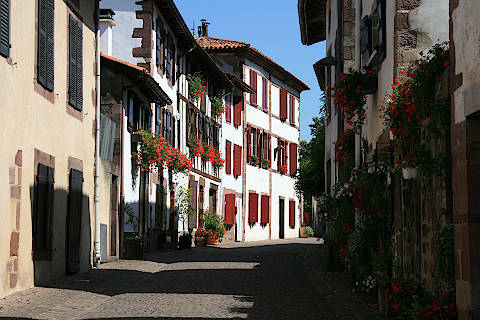 Saint-Jean-Pied-de-Port is a town in south-west France about 40 kilometres east of Saint-Jean-de-Luz. It lies at the foot of an important pass through the Pyrenees between France to Spain (hence the name of the town, which means 'at the foot of the pass'). It became an important town because of its strategic position on the pilgrim route of the Camino de Santiago de Compostella, also known as the Way of St James. 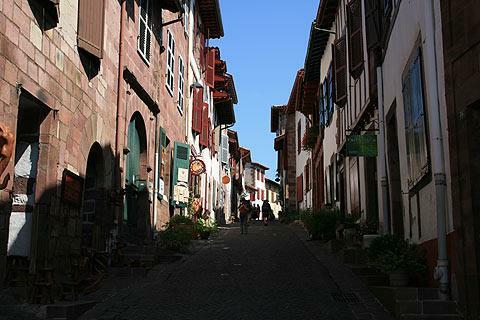 The old town of Saint-Jean-Pied-de-Port is really one old cobbled street, the rue de la Citadelle which runs downhill from the 15th century Porte St-Jacques to the Porte d'Espagne. A lovely old stone bridge crosses the River Nive and the view of the river and the old stone houses stretched along it is very picturesque. Up above the town you can see the citadel which once held great importance in Saint-Jean-Pied-du-Port. The original citadel was badly damaged in the 16th century when the Spanish laid siege to the town. 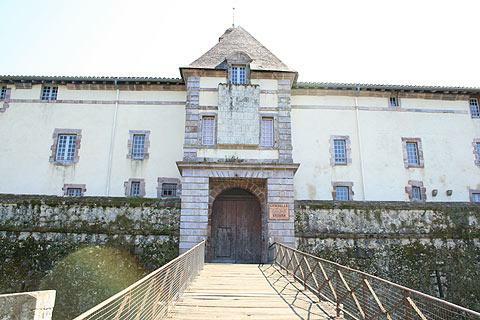 After that it was fortified under the direction of the Knight Deville and St Jean Pied du Port became a strategic stronghold for French troops. In the 17th century Vauban was commissioned by King Louis XIV to reinforce the kingdoms defensive mechanisms. Following his report further paths and ramparts were added to the town’s defences. Today the citadel houses a school. The Notre-Dame gateway, the Porte Notre-Dame, is the best preserved of the gateways to the town. The entrance to the hospital was next to this Porte Notre-Dame and the stone seats embedded into the walls on either side are for the poorer pilgrims to sit on and wait for the hospital to open and give out food and aid. Next to the Notre Dame Gate you can see the Notre Dame du Bout du Pont, the towns fourteenth century church. 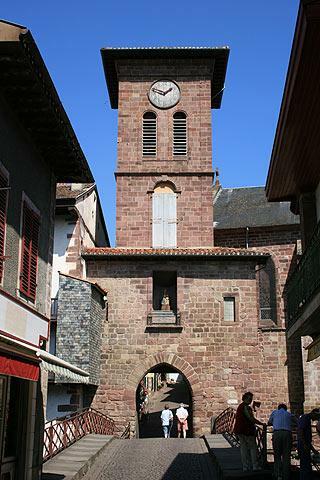 The France pilgrim paths from Paris, Vezelay and Le Puy-en-Velay converge at Saint-Jean-Pied-de-Port and then rise up and through the pass to the Monastery of Roncevaux (Roncesvalles) in Spain. For those walking the Compostella this is the hardest days of the pilgrimage. 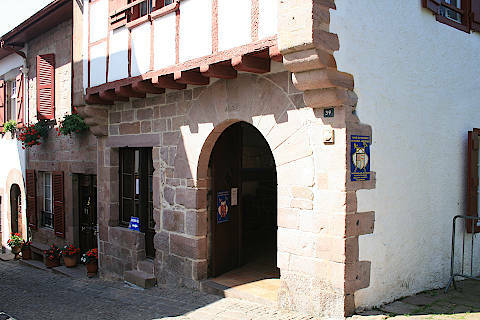 St Jean Pied du Port is very geared up for the pilgrims with restaurants offering pilgrim menus, a good value meal at a special rate for pilgrims, and shops selling anything you might have forgotten. The pilgrim office gives out pilgrim passports which you need in order to stay in the refuges (albergues) along the way and also have maps and useful advice. Look at our picture of a refuge to get an idea of what you have ahead of you if you are planning to walk the Camino. 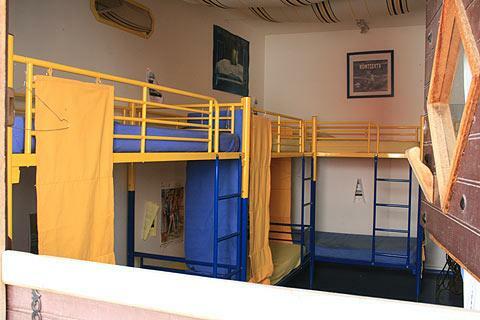 Though at the next stop there are about 120 bunk beds in one room so this one is luxury in comparison! 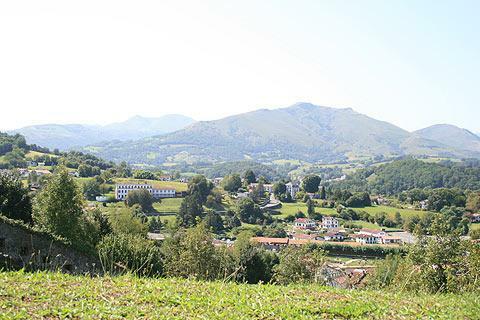 There are several charming basque villages to visit in the region around Saint-Jean-Pied-de-Port, above all between here and the Atlantic coast at Biarritz. Our favourite is probably Espelette, and you will certainly also want to visit Sare and Ainhoa, both classified among the 'most beautiful villages in France'.